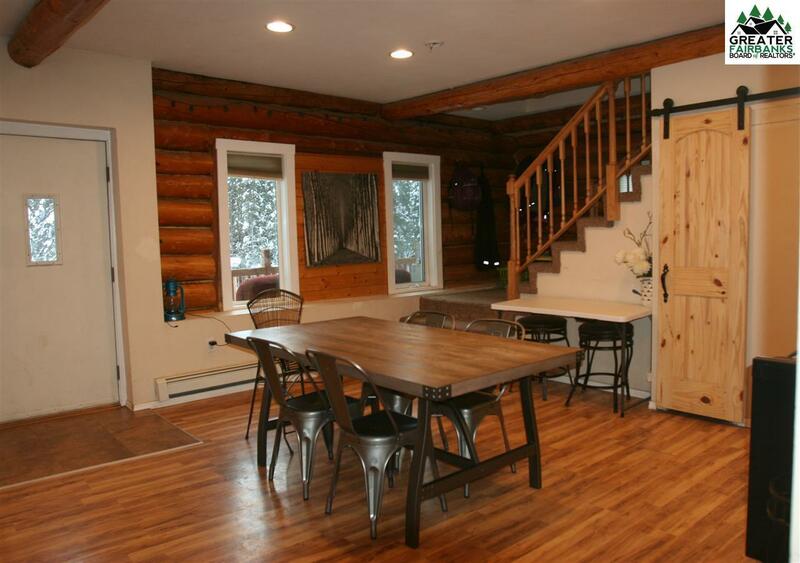 This hand scribed log home on 12 acres has only had two families owning it since origination. Originally built as a single family home, was completely gutted and remodeled on the inside in 2014 to create an up and down duplex. 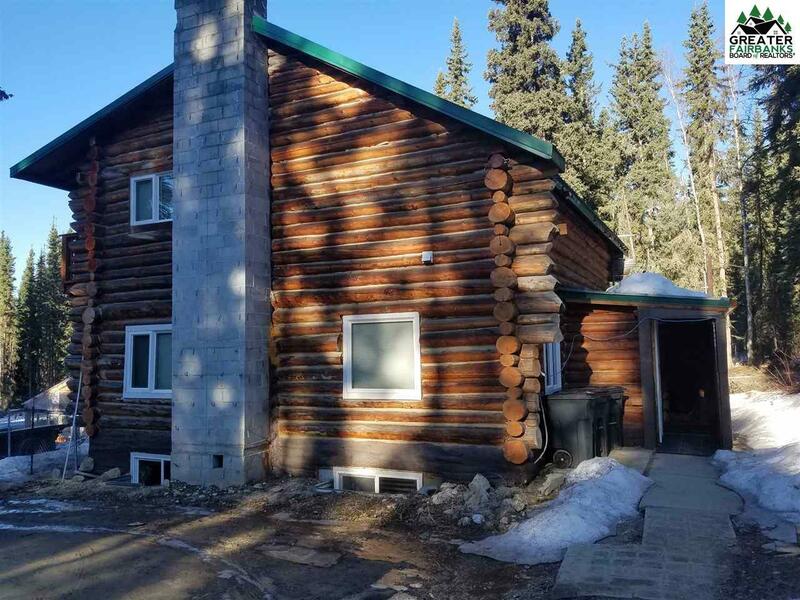 Prime location near UAF for rental potential! Live in part, and have a renter help/pay your mortgage or use as a single family. Additional space attached to the 2 car detached garage could easily be a man cave, workshop, or convert to a dry cabin living and earn more income! This home has so much potential that is only limited by your imagination. Cold storage arctic entry contains both doorways to the up and down units. Downstairs has three bedrooms, one full bathroom, full kitchen, generous living area. Third bedroom is currently being used as a kitchenette but is easily converted back to a bedroom. Washer and dryer hookups. Well and softener is accessed from inside, located under the furnace room keeping it nice and toasty. No heat tape needed here! 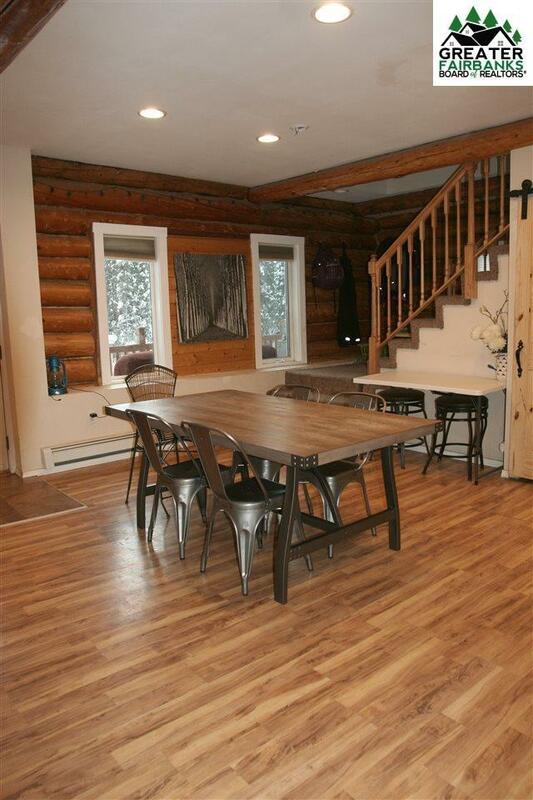 Upstairs you walk into a large open concept living/dining area with lots of windows south facing for natural light. The kitchen has ample storage and counter space. Half bath and laundry on main floor. Upstairs has two bedrooms and one full bath. Bonus small loft area, currently used as sleeping space but would make a good office/craft area. Master has two walk in closets and tons of space to include its own balcony. 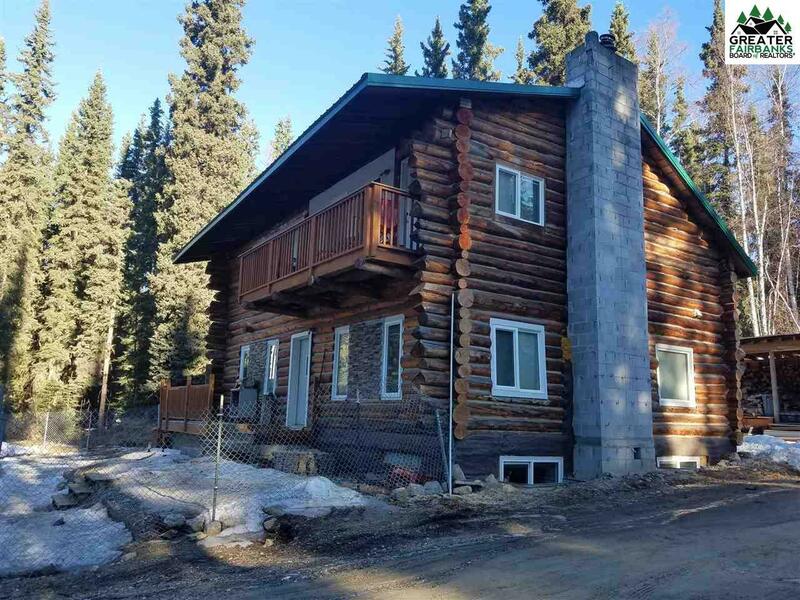 This home has a 5 star energy rating and sellers have recently made several important improvements, including EPA Wood stove, new boiler and hot water tank 2015, all appliances are 2014 or newer, metal roof 2014, back up generator panel for outages. Additional outdoor features include woodshed, greenhouse, custom benches, additional small storage buildings. Sellers also will convey all lumber/building materials in the shed near the garage, roofing material stacked behind the garage, and the pavers near the front door. Please do not disturb tenants, schedule a showing before driving up to the house, as Jacobson is not a thru road. Listing provided courtesy of Melissa Bristow of Home Town Real Estate.